The Big Bug Bag is an amazing animal encounter that brings exotic insects to schools, fêtes, youth groups, parties and other events so that children can explore the amazing world of invertebrates in a safe and familiar environment. 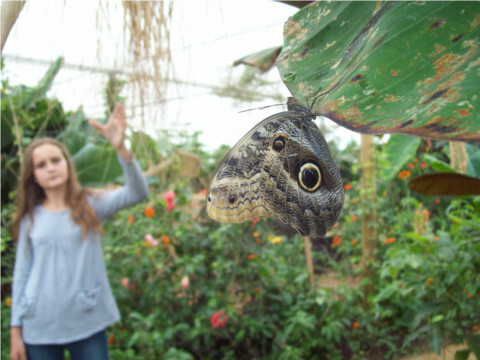 Pete's newest exciting venture, The North Somerset Butterfly House, is opening on Saturday 23rd March 2013, in Congresbury. The Butterfly House is a secret paradise hidden away in the heart of the Westcountry. There you can surround yourself with some of the world's most beautiful butterflies and exotic plants. Hunt among the leaves for bizarre caterpillars and exquisite chrysalids and look out for the terrapins as they laze by the water. You can find The North Somerset Butterfly House on Smallways between Congresbury and Yatton, it is the next car park after Cadbury garden centre, open 7 days a week, 10am-5pm. Follow us on facebook for updates. Check out the Events section further down the page to find out where you can see Pete and his bugs. This Autumn Pete will be bringing his bugs to towns across the country. 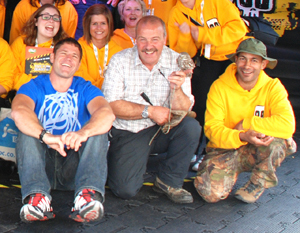 Come and meet Pete and his friends as he joins Steve Backshall on his "Deadly Days Out". Alan the scorpion, Daisy and Ethel the tarantulas, Margaret the whip spider and a host of other creepy crawlies will be roaming through the crowds. Deadly Days Out are free family fun days held on the Sunday after each Live 'n' Deadly (Saturdays on BBC2 at 9am). Steve Backshall (Deadly 60) will be interacting with some amazing animals on stage and there will be various activities and demonstrations going on and all for free (on a "first come, first served" basis). Don't forget to put this year's Bristol Festival of Nature in your diary! The event is on 12-13 June at Bristol Harbourside and you can download a flyer here (pdf file). 2 Flat Rock Scorpions, the longest scorpions in the world! A Giant African Land Snail called '9 inch'. A Malaysian Dead Leaf Mantis... a master of disguise! The Big Bug Bag website is finally here. I hope you like it! Catch one of Pete’s Bug Shows in the Village School. Pete will be roaming the festival site with his bugs and appearing in the BBC tent. Pete will be leading Bug Hunts and giving Bug Shows in the beautiful surroundings of Einstein’s Garden at the Green Man Festival in the Brecon Beacons. Come along and meet me and my bugs.